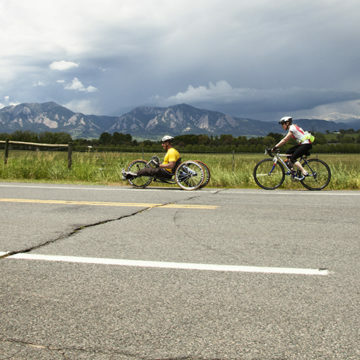 Craig Hospital, a world-renowned center for specialty rehabilitation and research for people with spinal cord injury and traumatic brain injury, will host Pedal4Possible on June 6, 2015. The charity bike ride, presented by LogRhythm, will feature courses for all skill levels, including a 10K, 50K, 100K and 100 mile route. All cyclists will start and end at the Colorado Technology Center (CTC) in Louisville, just a half-mile northeast of Highway 36. Handyclists are encouraged to participate. Tagalong bikes and trailers are welcome on the family-friendly 10K course. Fresh fruit, water and snacks will be available at each of the aid stations positioned every 10-15 miles throughout each of the courses. Sag wagons will rove each of the courses with water and road assistance to help riders experiencing mechanical trouble. All riders are invited to a post-ride party will follow with food and prizes and an appearance and a chance to ride with Muffy Davis, 3 time Gold medal winner at the 2012 Paralympics and Will Lachenauer, 2012 USA Handcycling Champion. Registration is $75 per participant and each rider is encouraged to raise $250 for Craig Hospital using a personal fundraising website. All money raised will fund innovative therapy programs that help Craig Hospital patients affected by spinal cord and traumatic brain injury thrive like Therapeutic Recreation, Nurse Advice Line, the PEAK Center, and many more. Pedal4Possible sponsorships are available, ranging from $10,000 to $1,250 with varying benefit levels. For more information about the event, to purchase a sponsorship, or to register, visit pedal4possible.org.